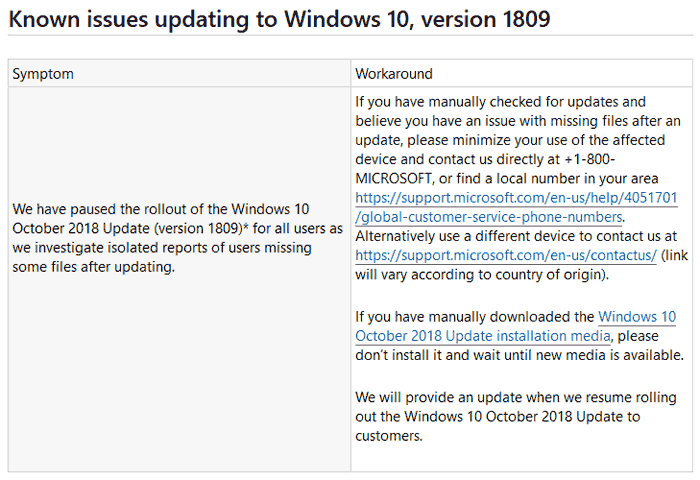 Microsoft started to roll out the Windows 10 October Update (version 1809) on Wednesday. It was launched to coincide with a new range of Surface hardware being unveiled at an event in New York. Features in Windows 1809 given prominence in the presentation and blog posts supporting its release were largely about Windows 10 getting cosy with your smartphone. In particular you would find it easy to move and use photos and texts from your mobile on your PC. However, as the week progressed the file unfriendliness of Windows 1809 started to grab the headlines. On Saturday Microsoft decided that the tide of consumer reports complaining about the latest Windows Update was high enough to pause the software rollout. There were more and more serious bugs being discussed on forums, with the most widely reported and serious probably being the deleting of user files in the Documents, Music, Pictures, and Videos folders. You can read more about this issue on Reddit, and Microsoft’s own forums, and of you care to search you will find plenty more reports and examples. Summing up the files issue with the latest Windows update; some users have had files deleted from the aforementioned folders, and there isn’t any solution from Microsoft about how to recover them. You might wonder how this kind of bug got past Microsoft’s army of Insider testers – it didn’t. According to Thurrott.com, this bug has been reported by users for months via the Feedback Hub. The above bulletin from Microsoft was issued on Saturday. Hopefully we will get some follow-up information shortly. In addition to the above missing files issues there is a known problem with hardware utilising Intel Display Audio Driver versions 10.25.0.3 through 10.25.0.8. Before the rollout of 1809 was ceased updates on platforms using this Intel driver may have been blocked to avoid “excessive processor demand and reduced battery life”. This article seems to have disappeared…. Well at least we know hexus runs on Win10 then! The update stopped my GPU from working. I just got a blank display. Using the latest drivers as well. Was definitely the feature update as I rolled it back and all was well. Says a lot that I downloaded it and installed it manually when I knew I had time to address any problems rather than waiting for it to be installed as scheduled, knowing there'd be issues and not wanting to have to fix them when I was busy.